Two week break!!! – I mean, I love my kids and my job. Blah, blah, blah… Let’s get real, though, not having to work for two weeks is pretty sweet, right?!?!? I was in New York City for an awesome Nor’easter that dumped 8 inches of snow in Brooklyn. Yes, I have now seen snow fall out of the sky two times. Yay! Quite a thrilling thing if you reside in the tropics and the humidity has been hitting 94%. Spring Conference – The AISL Spring Conference in Atlanta starts in a week! #SoExcited #Yay! Student Projects – Spring means that those of us working in project-based learning oriented schools start to drown in projects. We are in the midst of many, many projects so I’ve been thinking a lot about works cited lists and annotations. What do I think? One thing I think is that I don’t really care if the citations are in perfect MLA 8 format. Hah!!! There, I said it… Yes, I do not care if citations are wrong exactly, precisely right. I teach my kids to take the preformatted citations from databases and put them into NoodleTools. I realize that sometimes the citations are wrong. In a perfect world, all of the citations would be perfect, but in the imperfect real world that I live in, if my kids know that they need to cite the source for the content they’ve used and they’ve provided enough information so that the source can be easily accessed, that’s enough for me for where they are as high school students. When they write for publication in a peer reviewed journal I’m confident that they’ll know to take the time to get their citations right, or that at the very least, they’ll know how to find a librarian or editor who can help them build publication-worthy citations. Now, please don’t get me wrong, plagiarism is REALLY BAD, but in most cases I see the actual harm as being more cognitive and moral/ethical, than criminal. If you’re taking someone else’s work and presenting it as your own, you’re short circuiting your own learning. As a school librarian, that’s the harm I want kids to grasp first and foremost. If citation isn’t about “preventing theft,” then, why do we want kids to cite? After all, while I may not care much about the specifics of MLA 8 formatting, I’m still a proponent of “citation.” As I see it, for the kind of work that my students are doing, citation mainly serves as a framework for the initial work of source evaluation. Who is this author and why should his/her ideas matter? What clues about bias and orientation can I glean from the title? Do the container, publishing platform, or publisher provide clues about the orientation for the information? If the content is date sensitive is it past its expiration date? You can’t evaluate any of that if you can’t or don’t locate it so that seems like a good place to start. Two years ago we began encouraging teachers to require annotated bibliographies as a way to “encourage” engagement with sources–the whole source, not just the first page. I wasn’t really sure that the idea would be an easy sell so we came up with an annotation format that was intended to be as easy as possible. We got a surprising degree of buy-in from our teaching faculty so at this point a majority of our teachers are now requiring annotated works cited lists. Interestingly, our Social Studies department has decided that they would like students to use a more substantial OPVL (Origin Purpose Value Limitation) format that is often used in International Baccalaureate courses. We are currently in the midst of our first effort to use it at scale across all four years of high school social studies classes. Honestly, it is really good, but it isn’t easy by any means! This is all very much work in progress and I’m pretty much making this up as we go along so it isn’t exemplary by any stretch of the imagination. 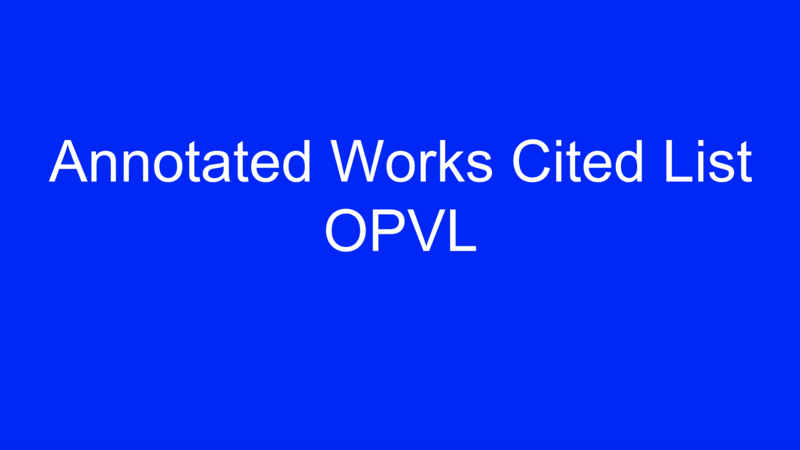 We’re giving this a go and we’ll see what happens… If you’re doing work with annotated works cited lists, I’d love to hear about what you are doing and how you are approaching the work! Looking forward to seeing many of you in Atlanta, but if you can’t be there this time around I’ll look for you virtually via the comments below or via the listserv.